“My dream job is to write policy in the federal government, and the Presidential Management Fellowship is a great way to get into a position to do so,” says finalist and Global Governance, Politics & Security graduate student Michael Dye. 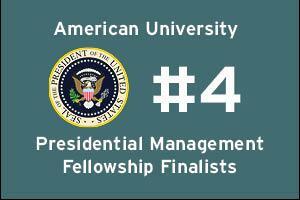 Through the PMF Program, fellows develop their leadership skills in order to become future government leaders. With 160 hours of formal training in management, policy, and leadership at federal agencies, a four to six-month developmental assignment, and the eligibility to become full-time or term positions after completing the program, fellows get first-hand experiences in government. International Relations Online graduate student Meredith Mantel was excited to learn she was selected as a finalist and, if selected as a fellow, she is looking forward to gaining exposure at different agencies. Congratulations to all of this year’s PMF finalists!